We estimate 1500 campers for the December Camps.. Many of these children are orphans and they pay a little over a dollar for their week of camp. Interlocking Ministries pays $20 per camper and we would like your help. 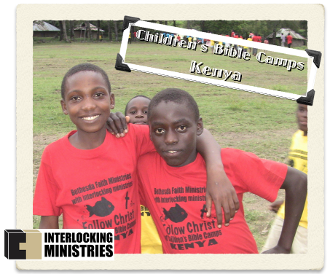 Sponsor a camper for Children's Bible Camps, Kenya. Sponsor more than one camper by adding to the quantity. See our video to discover more about this ministry. Click here. *This item (alone) is a gift to Interlocking Ministries. All gifts to Interlocking Ministries are tax deductible to the full extent allowed by law. Contributions are raised with the understanding that IM has complete control over the use of all donated funds. Our board-approved policy is that all gifts designated for a specific project be applied to that project, with up to ten percent used for administrative and fundraising expenses. Occasionally we receive more contributions for a given project than can be wisely applied. When that happens funds will be used for a similar pressing need.